Last March, housebuilder Pickstock Homes said it wanted to start building the first phase by the end of 2018, so we might expect work to begin quickly. It will take two to three years to complete. Planning laws decree that work on the first phase must begin within three years of the date of permission. That can mean as little as getting a bulldozer in for a day but I think there is a real commitment to this site. Phases two and three extend the development to the south. A detailed application for the second phase must be submitted to council planners within four years. The third phase must be submitted within seven years. It was always expected that, given the Ludlow housing market, the build out of this site will be slow. But at least there is a sign that we might get housing built. The affordable housing is very welcome and very much needed. The site is accessed from the A4117, initially via a T-junction. 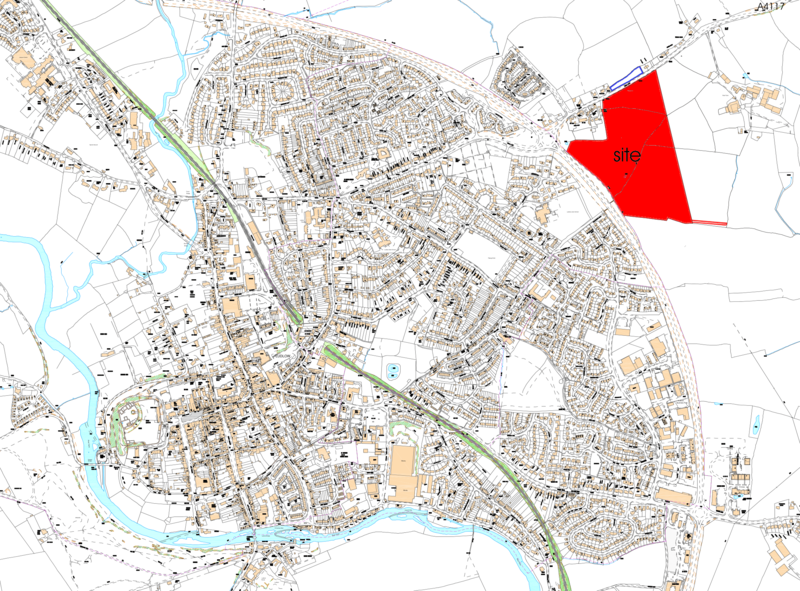 Land has been reserved for a future roundabout for later phases or continued development to the south. A link road threads through the site. Ultimately, it will join up with a road between Sheet Village and the Eco Park. There is vague talk of a masterplan for the whole area east of the bypass. This is required urgently. People can no more hold back housing development than they can the tide. So, we must plan for development properly. Right now we are adding bits onto Ludlow one chunk at a time. We need a spatial vision for the long-term future but that is missing both locally and in Shirehall. Previous Post What is the procedure for rough sleepers in Shropshire over the winter? What proposals are there for additional school and other facilities to accommodate this development and the others currently proposed? If all the developments come off, there could be pressure on schools but not from just one development. Any school expansion will be paid for through the Community Infrastructure Levy paid for every home built. Medical services may need to expand but as more patients sign up, they will get more money (though I am sure they will always be stretched). The biggest issue is sustainable transport. The bus budget and infrastructure budget are a hundred miles apart in local government. We can’t take many more cars in the town centre. There is government funding that could be used to improve the park and ride. But Shirehall has decided to submit a bid for Shrewsbury only this year. What a surprise! Hopefully this particular new estate will help maintain the Nelson Inn pub! The potential ‘future’ roundabout at Rocks Green – and the inclusion of a roundabout at the Bromfield development prompts me to ask again why a roundabout on the A49 was not insisted upon for the Foldgate development site? Surely this would go a long way to answering the current ‘impasse’ on tree removal etc? Roundabouts do not require sight lines, and from a safety point of view a roundabout would also slow traffic down for this new junction – something that a T-junction will never do. Even if a roundabout costs more to build, by the time all this lot is sorted it will have cost someone somewhere just as much in the end!